Uranus is a symbol of new technology, rebellion, revolution, enlightenment, and unconventional thinking. 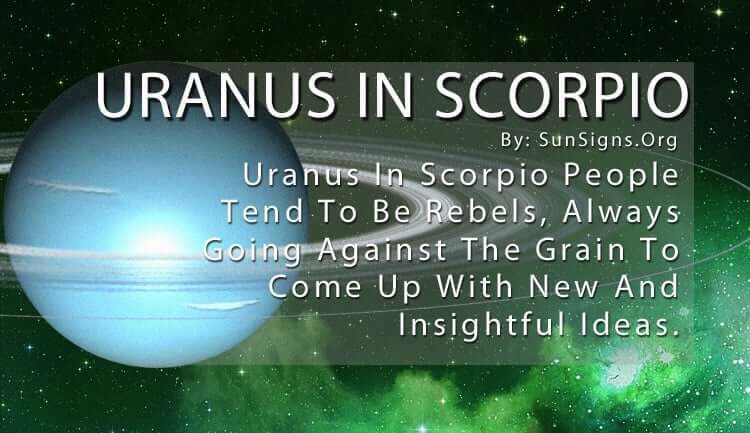 Uranus in Scorpio tends to be a rebel, always going against the grain to come up with new and insightful ideas. They pride themselves in finding their own unique style of experiments and inventions. But they keep such things hidden until they feel it’s the right time to reveal their genius to the world because they are leery of how others will react. Even though they come off tough as nails, inside they can be quite fragile. Uranus in Scorpio proves their worth over and over again without stopping to take a breath. They have to learn to take a step back and let things breathe for a while, for their laser focus can be quite stifling at times. Uranus in Scorpio may find that if they let go of their inhibitions, their creativity will flow more openly and freely. And if they can learn to trust others and allow them the freedom to do their own thing, that will take some of the burdens off their own shoulders. (Read about all the planets in signs in astrology). Their determination and strong will keep them heads above anyone else, although it may not be obvious at first. Uranus in Scorpio is more of a dark horse that you don’t see coming until the last second. That’s when they pounce. They don’t appreciate any kind of harsh criticism and will hold a grudge if they feel slighted in any way. Uranus in Scorpio throws their entire being into everything they do and they demand recognition for their rigorous efforts. They know no other way to operate except full-on and intense. This can make them difficult to work with sometimes because they despise giving up control of anything. The best way to handle a Scorpio Uranus person is to let them take the lead (which they will do anyway). With their excellent psychic powers, they can instantly read a situation and know how to handle it. They do the same thing with people, who they can read like a book, even though they reveal very little about themselves. But those close to them know they are fully capable of completing any challenge, the more difficult the better. Sometimes the Uranus in Scorpio can wear themselves out if they aren’t careful, both mentally and physically. But their massive stamina can keep them going for a ridiculously long time. (Read about Scorpio fitness). They are steady as a rock and willing to put in the hard work to move things forward. This means when they come up with something new they work tirelessly to see it through to the end. The main thing Uranus in Scorpio has to watch out for is their obsessive habits. They can become quite possessive of an idea, place, or person in their life and refuse to let go until they get their way. This can hinder productivity if the obsession gets in the way of going forward, whether in their career or their relationships. Uranus in Scorpio is brilliant, but they can sometimes lose themselves in their own passion and intensity. If they can loosen up a bit more, they will find more enjoyment in life.